The book consists of a bi-lingual commentary by Mairtín Ó Muilleoir on the modern artworks on display at the exhibition, which he stitches into his recollections of growing up in Andersonstown. As its title suggests, the artworks carry the pain and misery of the Troubles years, but always with redeeming hope. What am I talking about? OK, an example. 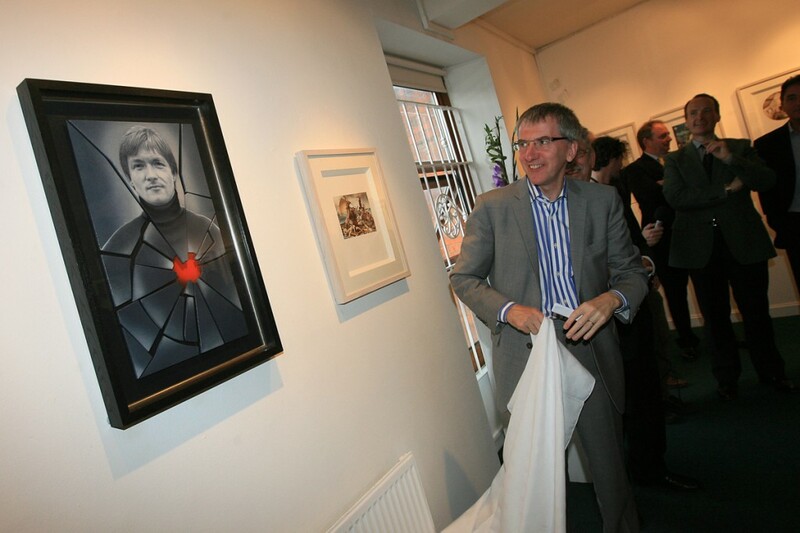 Portrait of Pat Finucane by Robert Ballagh shows the murdered Belfast solicitor in grey and black, with a shattering of red over his heart, like a bullet fired through a window. But the murdered lawyer’s hair is near-Beatles style and his expression has a hint of John Lennon – strong, near-cocky, as if the victory was his. Another example: Joe McWilliams’s ‘May The Lord In His Mercy Look Down On Belfast’. It shows a triple image – Sammy Wilson as Lord Mayor, Ian Paisley clutching a bible, the two men laughing. This in sharp contrast to the third image, a sombre, staring Peter Robinson in pinstripe suit. Your first reaction is to laugh, your second to feel apprehensive. And there are others – ‘Veil’ by Rita Duffy is a cubicle made of cell-doors from Armagh prison; FE McWilliam’s ‘Women of Belfast’ is a sculpture of a woman, arms and legs akimbo, apparently falling backwards; Dermot Seymour’s ‘On the Balcony of the Nation’ depicts a cow perched on the most insecure of cliff edges, a loyalist flag hanging in the dark plunge beneath her. My personal favourite is one I had to ask the gallery attendant to help me with. It’s odd. There’s a wall papered in repeated images of Ian Paisley and Martin McGuinness, both men laughing. Dwarfed by the wall is a beautiful framed picture of a bird. The title of the piece is “Some Wounds Healing, Some Birds Singing”; and as Ó Muilleoir notes, the reference is to the final entry in Bobby Sands’s hunger-strike diary : “Bhi na héininí ag ceiliúradh inniu” – “The birds were singing today”. Tears in the rain indeed. I’m probably the last person who should be reviewing this book or the related exhibition: not only do I not know much about art, I’m not even sure I know what I like. But I’m nearly certain the repeated jolts of pain and wonder from this exhibition, beautifully reproduced in the book, are good for my soul. If you didn’t get down to Great Patrick Street, get the book: it’ll show you how, as Ó Muilleoir puts it, art can turn “the coal of broken hearts into diamonds of unspeakable beauty”.